"Arctic Melting" (2016). Oil on canvas. Image courtesy of the artist. Landscape paintings instigate in me a sense of long-lasting connection. They make me feel grounded. Yet, looking at the works of Diane Burko, I get a feeling of impermanence. Her landscapes do not look entirely solid. I see in them cracks, pores, and deformations with liquefied layers underneath. Exhibited at the National Academy of Sciences in Washington, D.C., just a few of blocks from the White House, these works are a timely criticism from the artist, a well-established painter and photographer who has been devoting her work to environmental topics over the past few decades. Based on her extensive travel records, she designs series of paintings of vast glacial poles and island reefs. Her seductive, pleasing paintings of nature bate and pull us to fall for their beauty. And then, as we absorb the visual allure, we grasp the meaning of their inevitable loss. In her process, Burko takes on the roles of naturalist, painter, and activist. At the outset, she is a traveling naturalist. Through her extensive fieldwork she produces studious records of far-away geographies. Flying, hiking, and swimming, she photographs everything she sees, from the north and south poles to the Pacific and Atlantic oceans. Like a pre-19th century naturalist in fast motion, Burko criss-crosses the world, taking photographs in lieu of sketches, in the process of collecting information. Back at her studio, Burko changes roles from an environmentalist traveler to an artist. Using her photographic surveys as the source material for her paintings, she develops them into final canvases. As her paintings emerge, however, they seem different to me from those produced by the early landscape painters. The old canvases are imposing, masculine pieces that depict awe at the permanence of nature. Meanwhile, hers are concerned, and gentle. The audience sees her genuine worry that these landscapes will soon be gone, and heeds her activist call to prevent such an outcome. In the context of the 21st century, her practice takes on an added meaning. 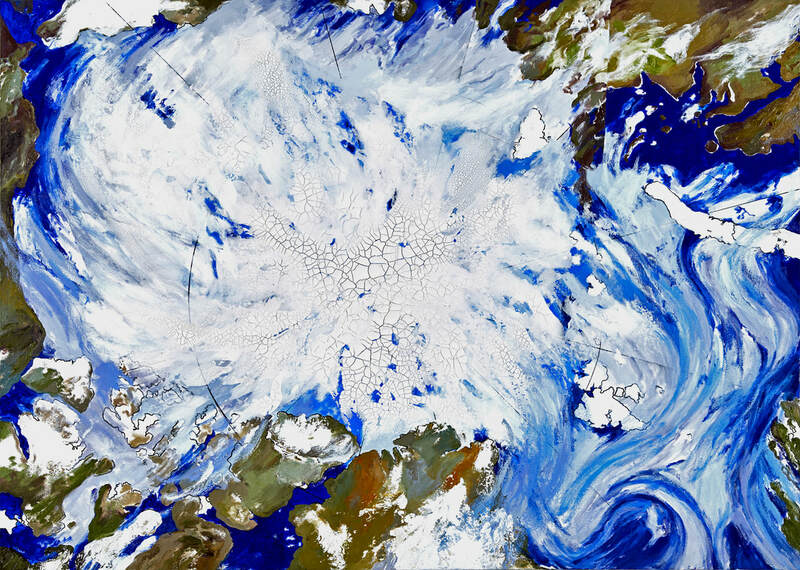 ​Visions of Beaufort Sea is an oil painting from her glacial series based on photos from the northern Arctic Circle. Burko constructs a glacial image form in thick impasto. She then interrupts this bright picture with patches of dark earth tones. She further dramatizes the imperfection of this glacier as she allows its surface to crack and appear damaged, revealing dark layers underneath. "Visions of Beaufort Sea" (2016). Oil on canvas. Image courtesy of the artist. 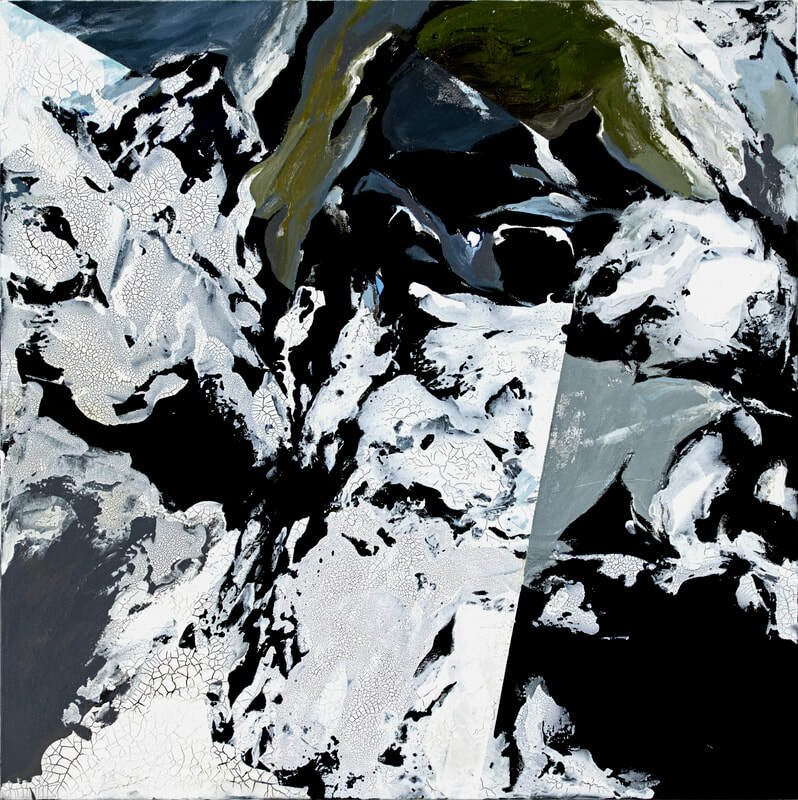 In Arctic Melting, Burko captures an aerial view of another glacier using centripetal strokes. The snow seems unsettled as she draws cerulean gestural lines on the pasty white spiral. Other darker blues and ochres frame this round bright area. I can see the glacier as a centrifuge, losing its cohesion, turning the solid snowy mass into dynamic composition reminiscent of weather maps. ​The consistency of landscape becomes even more ambiguous in her more recent reef paintings in which earth and sky are indistinguishable. 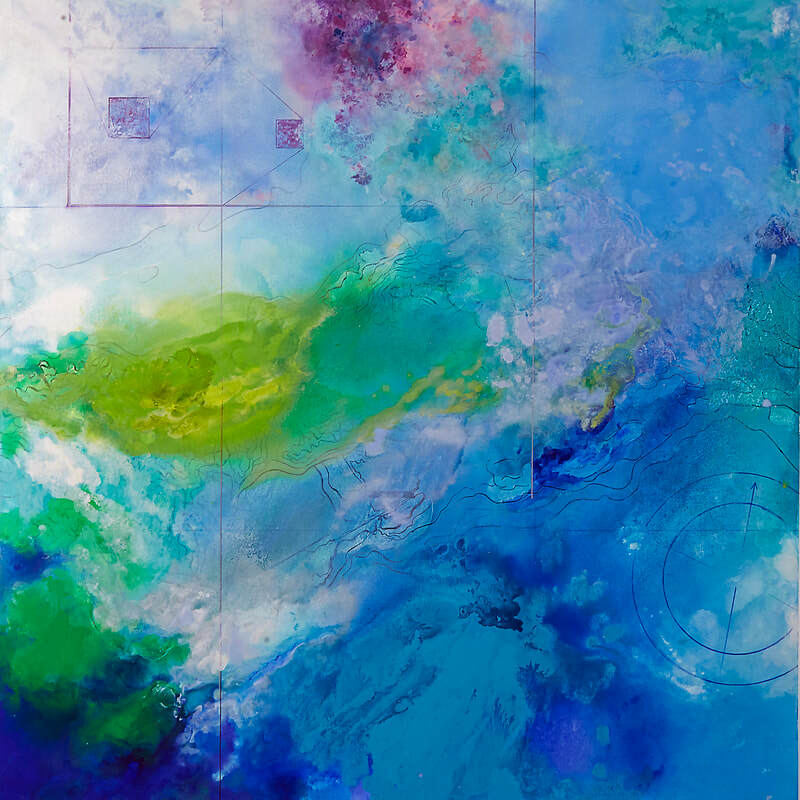 In her attempt to capture the fluid surfaces of disappearing corals in the American territorial islands, Burko shifts from oil to acrylic paint. This allows her to create thinner and more liquid-like surfaces. She handles her paint like watercolor, creating all-over pools of aqueous compositions meant to depict impressions of underwater colonies. Faga’alu is one such image of soft colorful patches blending into each other that we are guided by the label to interpret as water and sky. But Burko does not stop her work at the beautiful abstraction. 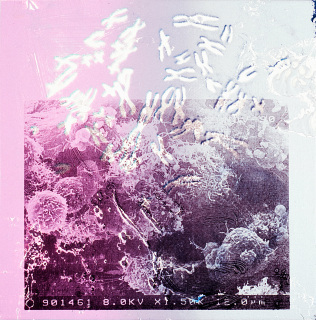 Adding science-based visuals to her work, she magnifies certain pixels to show their detail, borrowing this vocabulary from computer mapping. She also adds pencil marks outlining the geographic shapes of the reef’s interface. These lines follow the narrative of dissolved corals washing away into the turbulence of sea and air. "Faga’alu" (2018). Acrylic on canvas. Image courtesy of the artist. Looking at her reef paintings, I get the sense that Burko is in a rush. She modifies her practice in order to be able to complete her survey, creating series of smaller works. "Reef Grid" (2017-18) is a set of 27 small panels hanging side by side in three parallel rows. "Reef Lenticulars" (2018) is another series of transparent layered prints displayed in light boxes. The columns and rows of these works reflect multiple schemes that encompass the richness of submerged seascapes. With their various colors bleeding into each other, these assorted panels give the sense of underwater chaos. Yet, at the same time, organized in matrices, these sets of images create the appearance of validated formats of biological ecosystem studies. "Reef Grid" (2017-2018). 9" x 12" each. Acrylic on boards. Image courtesy of the artist. Through her painted survey, Burko provides to the viewer something that the camera could not. Her canvases are permanent records and concrete objects that demand attention. They are different from photo documentations that we can easily click through. Burko makes us pause, insisting we return to the slow practice of engaging with painting. Although her style is different from that of earlier nature painters like Thomas Cole and Fredrick Church, she also retains their foundational belief that despite modernity, a direct connection between humanity and nature is still possible. Nearly 200 years after her predecessors, Burko continues the tradition of showing our collective connection to the natural environment that we’ve been slowly melting and acid-washing away. She travels frantically and then paints in haste. Her encounters with nature offer testament to irreversible landscape changes. The escape to nature and the yearning for its stable connection turns into the acceptance of its imminent passing away. Thinking of landscapes as transient, she gives them the fluid quality of memento mori.